what the heck is a kalette, you might ask? and no, you shouldn’t feel like you haven’t been keeping up with the kardashians of the foodie-verse if you don’t have a clue what those are. i had never heard of them until recently, and for good reason – they’re a brand new vegetable! they’ve been available across the pond in the u.k. for some time under various other brand names – flower sprouts and brusselkale specifically – but this beautiful new green- and purple-streaked veggie is about to make its way stateside, and i was lucky enough to get to try it in advance of its big release in north american markets. (caveat: i swear to you, up and down, that i am not shilling for kalettes – i just tried them and genuinely think they are tasty and beautiful little greens). i thought this clean, healthy, yet flavorful recipe would be a great way to incorporate the new green into a dish, but if you aren’t able to find kalettes in your market – and you won’t be able to until at least fall 2014 – or you just don’t care about hot new hybrid veg, then don’t fret! any variety of kale or brussels sprouts would be equally tasty in this versatile salad, which is also delicious warm or at room temp. 1. Toast the chickpeas over medium heat in a small, dry skillet, until they start to smell fragrant and nutty and dark brown spots start to form on the outsides. Set aside. 2. Put one cup quinoa in a med-sm saucepan and heat on medium heat, swirling in the pan so as not to burn it, until just starting to toast and become fragrant, about one minute. Add 2 ½ cups (used dry measuring cup – figure out liquid equivalent) water. Add generous pinch each of coarse sea salt and black pepper. Bring to a boil. 3. Turn heat down to med-low and cover with a lid. Cook 15-20 minutes. 4. Meanwhile, cut off any thick, tough ends from the kalettes and separate large leaves from bunches. If you’re using Brussels sprouts instead, halve the sprouts (or quarter if large). If you’re using kale, cut out tough inner ribs, stack several one on top of the other, and then roll the leaves up, cigar-style. Once you have a roll of leaves, slice thinly. 5. While the quinoa is cooking, heat a skillet over medium heat and coat with oil. Once oil is warm and beginning to shimmer, add onions and ¼ tsp each salt and pepper. 6. When onions begin to soften, after about 5 minutes, add the squash. Cook 2-3 minutes. 7. Check the quinoa (it should be just about done). If all the water has evaporated, and little translucent bits are showing, it’s done. Fluff with a fork, then cover again with lid to steam and keep warm until ready to serve. 8. Add kalettes and minced garlic to the pan, along with vinegar, turmeric and celery seed. Cook 2-3 minutes, stirring. 9. Add chopped tomato and chickpeas and cook 1-2 minutes more, stirring continuously. 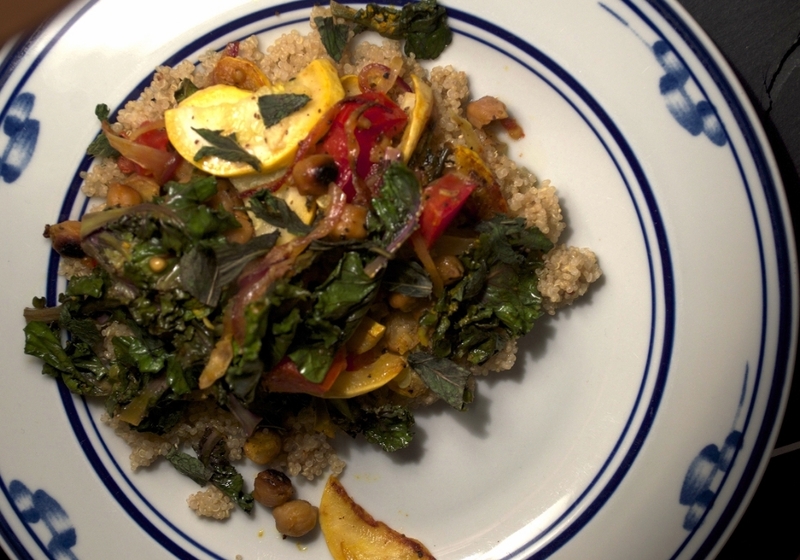 Serve sautéed vegetables over bed of quinoa, drizzle with olive oil, and garnish with torn mint leaves, if desired.